Quotes are without freight- I need your zip code? NOTE: ALL DYNO PACKAGES CAN BE UPGRADED WITH ADDITIONAL OPTIONS! Dyno quotes do not include freight. Will need your zip code for freight estimate & Insurance or your nearest port if shipping over-seas? 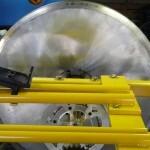 We are constantly improving the way we do things in the manufacturing of Hewitt Inertia dynos. If we find a better way to keep things as simple and low cost if possible, but still keeping quality high. PACKAGE#0-($3799.99)- LOW COST STARTER DYNO, 25 HP Flywheel with 1 ¼” axle with basic (3) bearings, basic usb data system with S.A.E. weather correction, all the normal included parts to get you started. Includes refurbished computer (new mouse & keyboard). No powder coating. You supply monitor, low engagement clutch, international (wide) motor mount, surge protector. Or I can supply for you? Package #1 – ($4449.99) a P.AK. (Partially assembled kit) DYNO, the main frame is totally welded to make sure its square & level. We will install the balanced 30 hp axle flywheel assembly. We will install the brake bracket because it must be installed correctly! 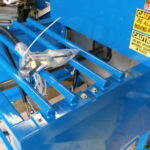 Then all the other parts are tacked welded in a way so you can finish welding them without any specials clamps or tools. 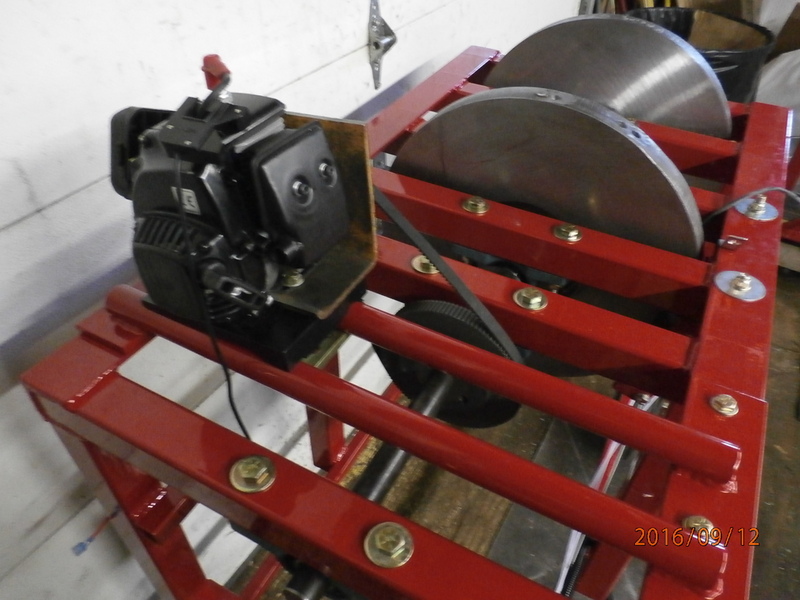 A 30 hp flywheel assembly with (2) (Japanese made) oversize self centering bearings on a 1 3/4” axle, with a basic USB data system. This flywheel assembly will include sprocket hub, sprocket, chain guide, chain, special clutch with correct springs and drive sprocket. I can supply international (wide) motor mount & computer monitor (for optional price, $74.99). Basic data system will let you compare one dyno pull to one other. You can see torque, horsepower and acceleration. This software (“Pro” software can be included for $100.00) & data system can be updated with several options. This package will include a refurbished dual core computer (new keyboard & mouse) with a one year warranty (if you want i3 computer, add $59.99) which will be updated and software installed and set-up, then tested to make sure it all works when you receive it. Includes 8 outlet surge protector. This dyno will be bolted to pallet and shrink wrapped only. Package#2– ($4779.99) Dyno is ready to use when you receive, includes all above but I do all work to finish dyno, test and ship to you in un-powder coated form. Does not include protective crating, only shrink wrapped. 1 ¾” AXLE & BEARINGS. NOTE: QUARTER MIDGET CLUTCH ADD-ON-($875.00)-this is a popular quarter midget clutch & jack shaft add-on kit that uses chain and a clutch to convert quarter midget engines so they can use a regular clutch. This can also be done with a belt drive clutch and belt drive for the dyno also? I do not have a price on this right now. Belt drive is much more accurate and last much longer than chain. PACKAGE #2.5-($4843.50) this is a 25 hp flywheel with 1 ¼” axle with 3 bearings. Mini-usb data system, S.A.E. weather correction, premium flywheel sensor, engine rpm wiring but no engine rpm box (you can update in future). Premier titan clutch with correct springs and driver. Includes palletizing & protective crating. Includes refurbished computer, with updated windows and software set-up and tested. Package#2- ($4779.99) Dyno is ready to use when you receive, includes all above but I do all work to finish dyno, test and ship to you in un-powder coated form. Does not include protective crating, only shrink wrapped. 1 ¾” AXLE & BEARINGS. Package #4-($5232.99 ) (Standard Duty 2-CYCLE DYNO, or Slingshot Dyno? #35 or #219 chain? This comes with 35 hp flywheel. (#219 chain is also extra cost added?,$74.00) This is what I recommend from experience would order for close to the perfect low cost dyno. I would add S.A.E. Weather correction done by the computer, done every dyno pull. This would make your dyno more accurate during varying weather changes? I would order “Pro” software so you can compare up to 6 graphs or reports at one time. 1 ¾” bearings installed! This would let you use your dyno for years before having to tear the dyno down to replace axle bearings. And with this option you are using only 2 oversize self-centering bearings instead of three, so the dyno will be much more sensitive & accurate with less axle bind/flex on the shaft. Accurate to less than 1/10th of a horsepower! Package #5-($6032.98) In this package, I would add 3-disc clutch with belt drive(4-cycle only), including (2) belts installed on axle. Belt drive is much more repeatable than chain drive. Chain drive tends to seize or gall up internally and give you varying hp/tq changes, due mainly to chain not being greased or lubed internally on a regular basis, since it flies all over dyno when you do lube it. Includes both large drive sprocket for axle and QD hub with new clutch 3 disc clutch including (2) belts. Includes new 3-disc clutch with proper drive sprocket. I have them set it up for about 3000 to 3200 rpm engagement. Accurate to less than a 1/10th of a horsepower! Package #6-GM Electric Start & 30mm Belt Drive. ($6585.77) This is adding GM planetary gear reduction starter, 30 hp flywheel with all wiring, relay, cables, labor, flex plate, backing plate, fasteners etc. And the lower cost 30mm rubber belts for clone & flathead, (Animal is questionable? because they tend to kick back on start up or shut down.) (Ask me about this?) If you break 30mm belts on Animal, we can update you to a kit for an optional price with 50mm belts and engine driver ($360.00). or we can start you out with 50mm ($135.00) and forget 30mm for a slight price increase. PACKAGE #7-($6999.99) 35HP FLYWHEEL, DIESEL ELECTRIC START, 144 TOOTH BELT DRIVER X 30MM BELT DRIVE, MINI USB DATA SYSTEM, REFURBISHED COMPUTER. -Diesel starting system that cranks much faster & with more torque for big engines or hard starting engines. Has “Pro” style belt drive which allows other combinations of drivers & belts on different engines. Can upgrade to Kevlar belts or 50mm belts ($360.00). Has low cost Data system to get you started. If you’re thinking of Air/Fuel ratio or electronic blow-by or both, I’d recommend you upgrade to “Pro” data system. Has low cost computer to get you started or we can update you to New Acer 17.3” laptop or NEW Lenovo desktop with 23.5” wide screen monitor. 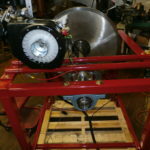 PACKAGE #8-($11754.85) 60 HP “DUAL” FLYWHEEL 2 OR 4-CYCLE DYNO, Dyno all your smaller 5 to 35 hp engine on single flywheel and larger 30 to 65 hp engine using second flywheel engaged. 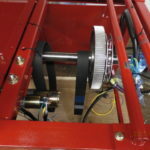 Includes dual motor mount rails, (always dyno larger hp engines nearest axle bearing and lower hp in center of dyno axle). 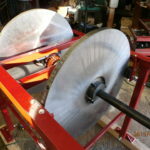 Chose any combination of flywheel, example may be 25 hp primary flywheel and 35 hp secondary. Or the other way around. This dyno has quoted extra heavy duty bearings which will last longer and are higher priced. Has “Pro” data system quoted (S.A.E. Weather correction, 4 temp channels, extended length leads for dyno room. Expandable to 21 channels, with Air/Fuel ratio. (2) extra #219 gears & (2) boxes #219 chain included. Also has new Lenovo desktop computer included. (This dyno can come with dual electric start and belt drive for optional price?). PACKAGE #9- 3 TO 200 HP COMPUTERIZED WATER BRAKE DYNO-($9771.54 Estimated? )-This is a water brake dyno cable of up to 200 hp with a computer pressure transducer thru load cell to measure hp & torque. 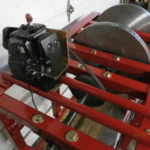 Can be used on horizontal & vertical engines. This quote is only for Horizontal engines only. Shaft can turn either direction and can do 2-cycles up to 20,000 rpm. This is a good dyno for using on stock type engines with governors where you have a narrow power to measure. Inertia dynos have a hard time working on such narrow power bands. This dyno won’t be as accurate as inertia, (2 to 3 tenths of hp) for racing type engines. It loads engines from high rpm down to low rpm using a water load valve. Could add fuel flow or air/fuel ratio or electronic blow-by. PACKAGE #10, 30 HP HYDRAULIC DYNO WITH ELECTRONICS ($6485.63) This is a hydraulic dyno for up to 30 hp (maybe more?) using pressure transducer on high side hydraulics. Also with mini-usb data system. Includes large table with top plate Blanchard ground and locking tube type casters. Includes a new desktop computer. This dyno also had a fuel flow sensor installed, which could be taken out and price lowered ($975.00)? We tested it on a 6.5 diesel engine. 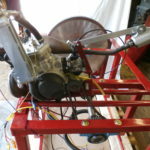 This entry was posted in Dyno and tagged engine dyno, horse power, inertia dyno, motorcycle dyno, quarter midget dyno on November 21, 2017 by admin.